If you’re looking for a team environment, one on one coaching, and insightful instruction, URSA Academy is an excellent choice. I can honestly say that all members of the gym were as interested in my development as the coaches and staff. I learned almost as much from my peers as I did from Kris. Moreover, the size of the class is perfect; it seemed common to be stopped mid-activity and given individualized instruction on how to improve my form. Lastly, Kris is able to break each technique down into its individual parts so that even those of us who were new to the sport could understand and improve on a daily basis. URSA Academy is a great place to learn an incredible sport and make some great friends while doing so. I have been training martial arts for over 14 years and have trained in several disciplines. I can tell you with certainty that there is a difference between doing a technique and understanding what’s at the core. At URSA Academy/Ribeiro Jiu-Jitsu you learn what’s at the core of the technique. They teach you not only how to do the technique but how & when to apply it. You develop a really strong foundation. URSA Academy is a great school! 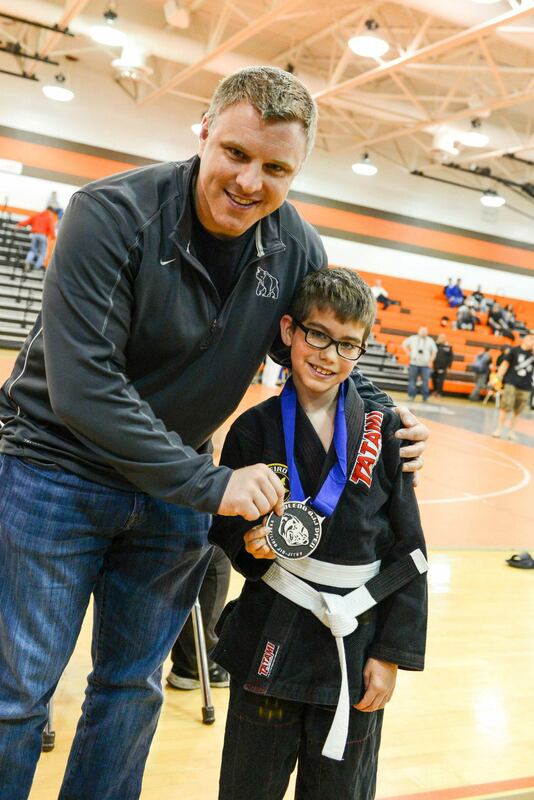 Professor Kris Magers and a Medalist at the Toledo BJJ Open! I have been training Brazilian jiu jitsu since 1996. During this time I have taken classes from many different instructors. Kris Magers is one of the best instructors I have been fortunate to train with. He knowledge of the details of each move is exceptional. This will allow students to progress more rapidly than others. The structure of Kris’s program also allows for learning in a safe and fun manner. The people of Ann arbor are very fortunate to have such a great jiu jitsu school. I started training Braziilan jiu jitsu with no prior grappling experience. I was very nervous before my first class. Professor Kris Magers and the students at URSA Academy did a great job of teaching me and making me feel comfortable in the first few months. Before I knew it, I was hooked. In the last two years, I have enrolled five of my six children in classes and they love it! We have all competed in a few tournaments and I have earned my blue belt. Since anyone of any size and age can safely train BJJ, it has become a great way to spend time with my family. Instead of sitting in front of the TV, we are learning and getting great exercise together. BJJ has changed my life and my family’s life in so many ways. I look forward to many more years of training. 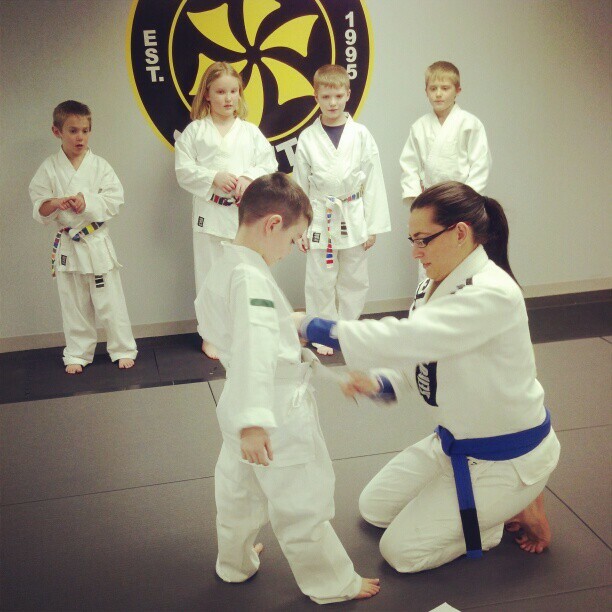 Coach Amy During Stripe Promotions in the Kids Martial Arts Class!